I noticed 2 errors in the French rulebook from Z-Man Games. Final Scoring Tile section, in English it read "Owns the most structures that are part of federations (the Lost Planet’s mine counts as a structure)." Which translate to: "Owns the Federation with the most structures (the Lost Planet’s mine counts as a structure)". It should be: "A construit le plus de bâtiments faisant partis d'une Alliance (la mine sur la planète Perdu compte comme un bâtiment)". 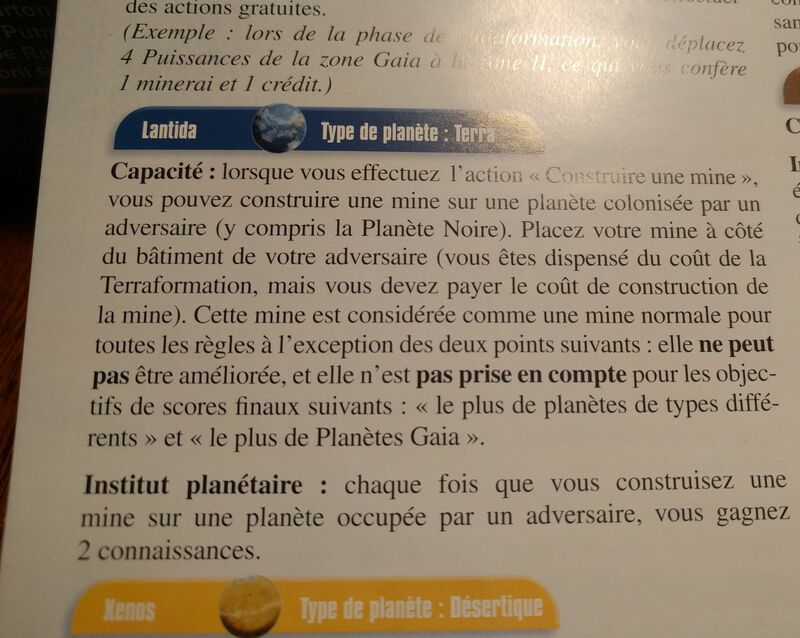 Lantids Ability section, in English it read : "[...]it does not count for any effects that relate to how many planet types or Gaia planets you have colonized." Which translate to: "[...]it does not count for the following Final Scoring Tiles: "Colonized the most different planet types" and "Colonized the most Gaia Planets." It should be: "[...]elle n'est pas prise en compte pour aucun effet qui est en lien avec le nombre de planète de types différents ou le nombre de planète Gaia que vous avez colonisé". C'est vraiment dommage pour un jeu de cette qualité. Ah ? J'y ai joué 10 fois et je n'ai jamais vérifié la version anglaise des règles. Maybe those where late changes to the rulebook short before it was finished and they already had it translated to frensh at this point.